MAC, whether you love them or hate them they are easily one of the most world renowned makeup brands that both makeup artists and makeup novices alike turn to for the perfect variety of finishes with endless shade ranges. Over the past few years I've built up a 15 pan eyeshadow palette as well as two 4 pan eyeshadow palettes, full to the brim with shades I am absolutely smitten with. But at £10 each per shadow, not forgetting the cost of the palettes themselves, building a MAC palette big or small can be a very costly process. Today I'm going to share with you some high-street dupes for some of my favourite and most used MAC eyeshadows, budget-friendly options that won't break the bank. MAC Coppering (£10) is described as an orange copper and is one of my favourite MAC eyeshadows ever. I adore this one in autumn when teamed with sultry nudes and warm browns as a real vibrant pop of colour, a shade which also works incredibly well as a stand-out shade in summer. It has a frost finish with warm undertones, it has very slight orange undertones which makes it a real standout copper. 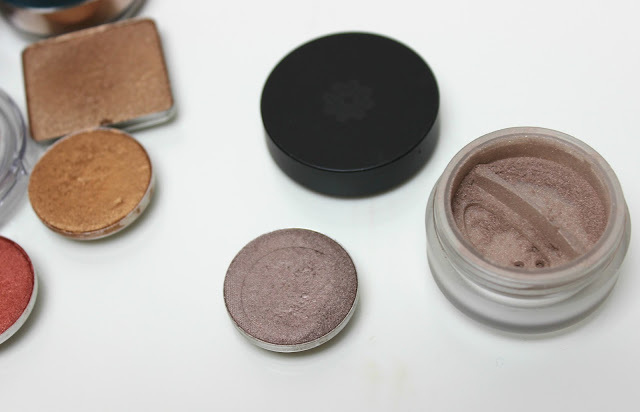 The Body Shop Golden Cinnamon (£7) from the Colour Crush Eyeshadow range is a great alternative, the closest match to Coppering I've come across. With a pearlescent finish it's slightly warmer than Coppering, lacking the vibrancy of the orange undertones Coppering has, but very similar overall which makes it a great dupe with a saving of £3. 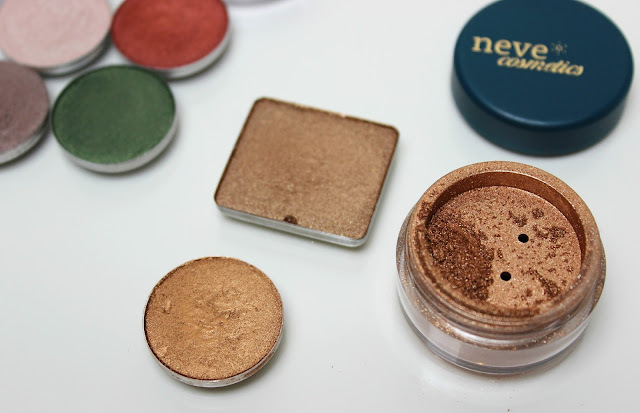 Colour Crush shadows are absolutely fab; lovely powder formulas with amazing colour pay-off and great longevity, a range I highly recommend checking out! Another one of my favourite MAC shades, MAC Humid (£10) is an incredibly beautiful mossy green with frost finish that is one of my go-to shades for both autumn and winter. I adore green eyeshadows and Humid is quite simply one of the most stunning green shadows I have ever come across. From the same range as Golden Cinnamon, The Body Shop Fig Leaf (£7) is pretty much an exact spot-on dupe for Humid. The only slight difference between the two is that Fig Leaf has a pearlescent finish with a tiny amount of super fine shimmer, otherwise? These two are like twins. MAC Satin Taupe (£10) is probably one of the most coveted MAC eyeshadow shades, one that almost every MAC adorer has. A warm taupe with frost finish, it is perfect for a wash of colour over the lid, gorgeous when teamed with neutral shades and works really well blended through the crease for a light smokey eye. A budget-friendly alternative is the Lily Lolo Miami Taupe Mineral Eye Shadow (£5.99). Cooler in tone than Satin Taupe it has a flattering silver undertone which gives it less intensity than Satin Taupe, but for the price makes a great dupe. MAC Phloof! (£10) is a lovely highlight shade that I adore for the inner corner to open up my eyes. A warm toned pale beige, it has a frost finish and gets most use from me in spring as it's just the right tone to make my eyes look bigger and brighter. An almost exact dupe, No7 Wheatsheaf (£7) from the Stay Perfect Eyeshadow range is pretty much exactly the same as Phloof!, with just a subtle touch of champagne to tell them apart. This has been one of my favourite shadows for a couple of years now, a high-quality velvety soft powder shadow from a seriously underrated range. Last but not least and a shade which I have two high-street dupes for, is MAC Amber Lights £10. Gosh this is a beautiful shade! Another frost finish (can you tell I like frost finishes from MAC? ), Amber Lights is a stunning warm toned copper which is less vibrant than Coppering as it doesn't have those bright orange undertones, making it a more flattering and wearable copper. 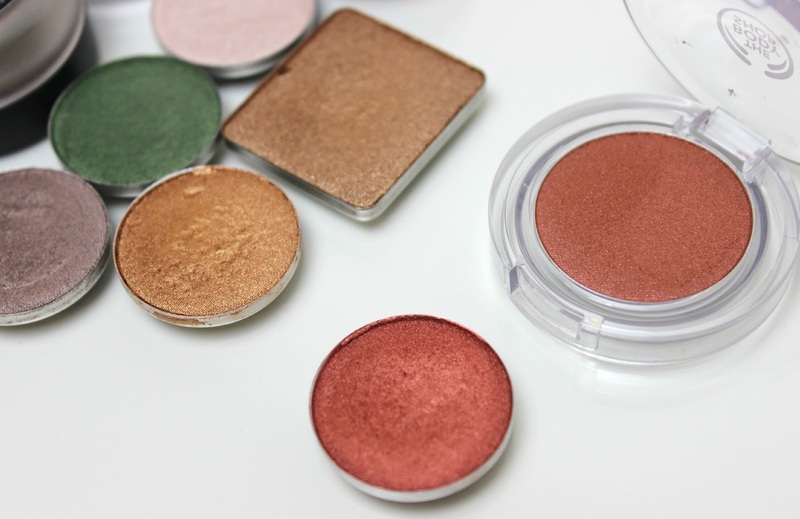 Inglot 34 Freedom System Eye Shadow (£5) has a shine finish and is only slightly warmer than Amber Lights, whilst Neve Cosmetics Versailles Mineral Eyeshadow (£5.95) from the French Royalty collection is slightly cooler in tone with a more shimmery finish. Both make great alternatives to Amber Lights, great dupes for the price difference! I love MAC eyeshadows and if they're within your budget, I'd really recommend in investing - but if you're looking for something more budget-friendly, there are so many great brands and shades out there. I hope this post has been useful for anyone looking for MAC dupes, and if you have any dupes of your own for MAC eyeshadows, I'd love to know what they are! Great choices! 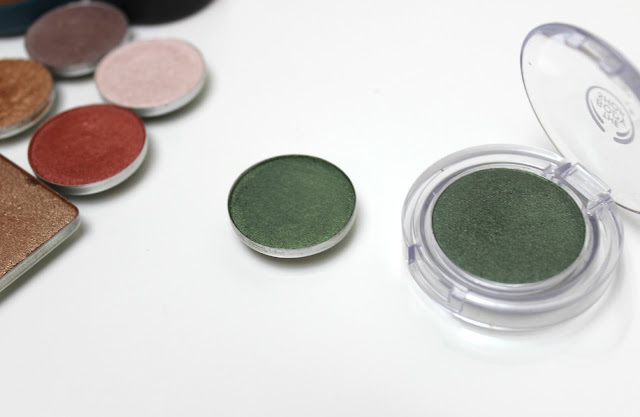 Definitely need to check out The Body Shop's eyeshadows! 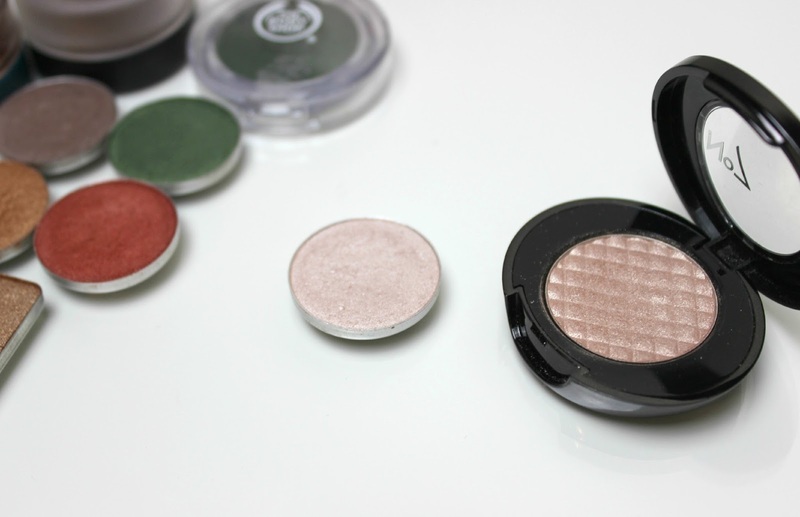 I always struggle with drugstore eyeshadows but I do love The Body Shop offerings; they're stunning and so easy to work with! I'll definitely have to check out a few of the others mentioned though! I love a good dupe. But in reality you can’t match the quality of MAC eyeshadows.